Aiming to improve upon the operational and setup convenience of its previous combi-drill, we try out Kverneland’s latest e-drill Maxi. Working in sticky soil conditions and small fields with twisty headlands provided an ideal test for Kverneland’s latest power harrow drill combination. Essentially, the new e-drill Maxi replaces the i-Drill Pro, and complements the smaller capacity e-drill Compact in KV’s range, which replaces the S-Drill. Working widths include three, 3.5 or four-metre machines, with hopper capacities ranging from 1,600-2,000 litres for the Maxi. It also gets a new design of power harrow underneath, now rated to 180hp. 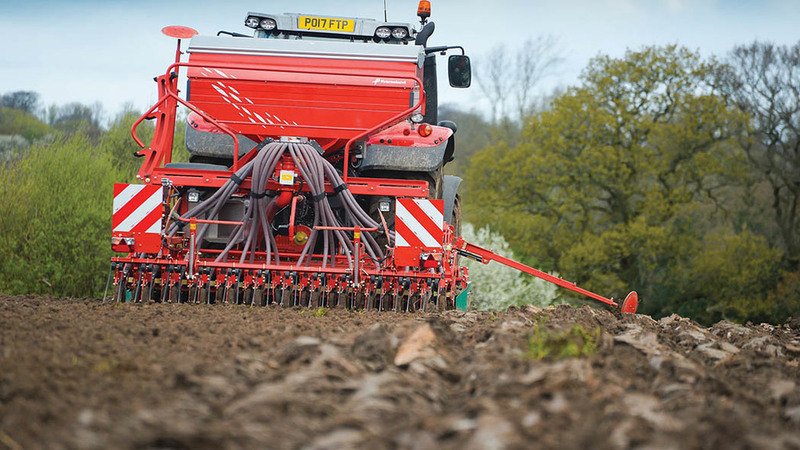 To get a flavour of the new model, we tried out a 3m version of the e-drill Maxi with 2,000-litre hopper. Power came courtesy of a 180hp (200hp boosted) Massey Ferguson 7718 tractor. AS on the old i-Drill Pro, the hopper is mounted on the headstock of the power harrow. Now though, the hopper and drilling unit are mounted closer to the tractor, improving stability over its predecessor. This does make it quite a tall unit, especially with the higher capacity hopper, but does afford half-decent sight lines under the hopper and to the drilling unit. For flexibility, the drilling unit can be dropped off relatively easily, allowing the power harrow to be used as a standalone machine. However, unlike other machines where the hopper also detaches along with the drill, this remains fixed to the power harrow’s headstock. KV tells us a dismount kit for this is currently in the design process. 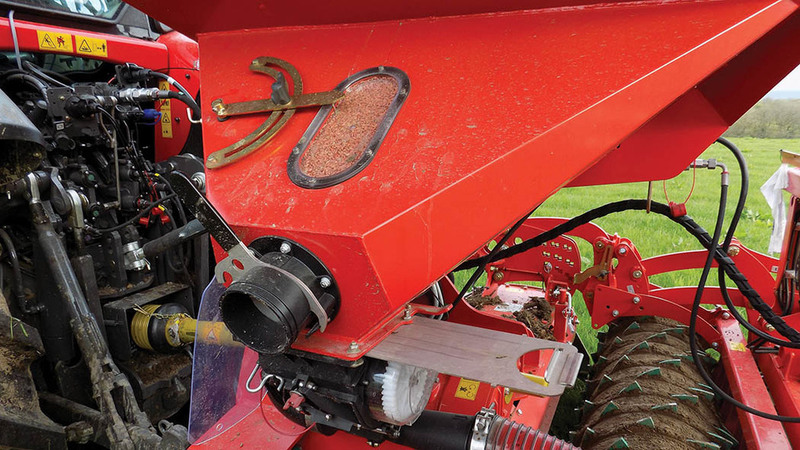 The hopper itself is a modular design shred with the manufacturer’s range of fertiliser spreader. This allows simple aluminium hopper extensions to be fitted or removed, increasing or decreasing capacity. 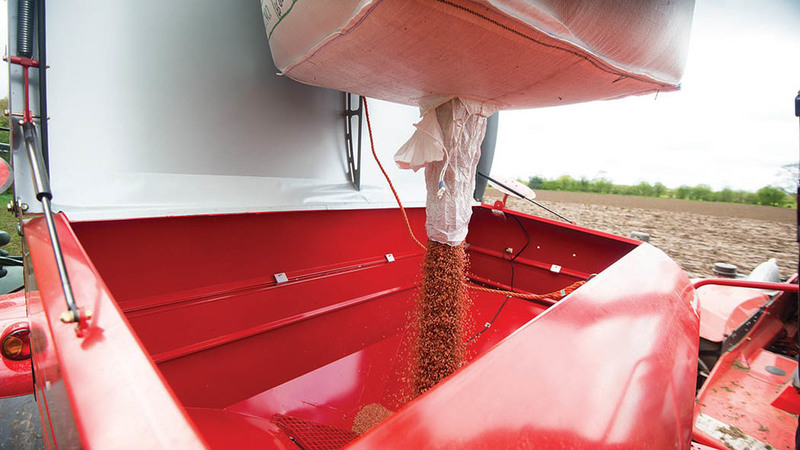 For ease of adjustment, the tank level warning sensor can be externally adjusted, offering an earlier or later warning of when seed level is getting low. Up-top, gas struts help lift the large lid, which also features a break-back system in case you hit the lid with a seed bag. A good sized platform also allows safe and secure filling. 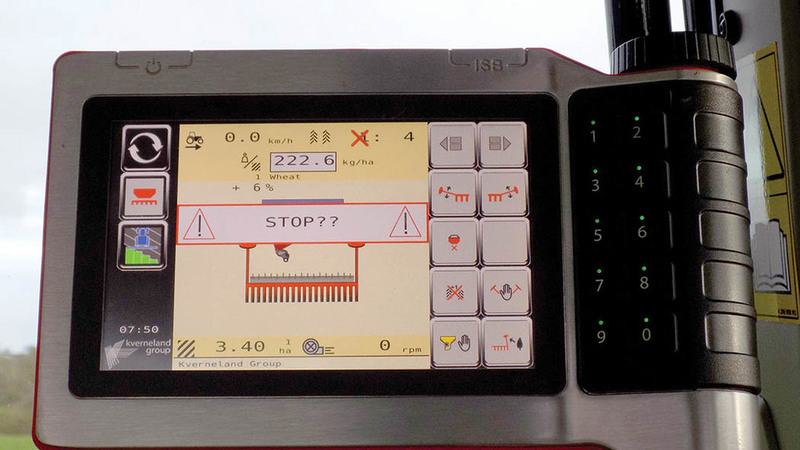 The IsoBus compatible drill can be controlled by KV’s top-spec Tellus terminal or, in our case, its smaller Tellus Go; both of which are touchscreen, with the latter offering ‘hot’ keys to navigate. All the usual drill settings can be made through the controller, including rate and tramline widths. When coupled with GPS, it also offers automatic headland shut-off, based on a virtual boundary. Variable rate control is also possible. It can record up to 20 lots of drill settings which can be recalled for different jobs. Delving deeper, further settings offer the ability to alter metering triggers and change which speed input the drill uses. For us, the metering unit was simply triggered by a switch on the packer roller and a radar on the drill offered speed sensing. If all fails, manual control of metering and rate can be carried out, which can be sometimes useful for headlands. Real-time graphics on the Tellus Go show reassuring information that everything is working as it should be, such as fan speed, metering rate, tramlining and marker position. You can also set a fan speed tolerance, which sounds an alarm should the fan run too fast or slow. Other alarms will also sound if calibration hatches have been left open or if seed level is getting low. Most sensors used throughout the drill are identical and can be switched between if you get caught short. The firm’s all new Eldos metering unit is used, which is a cartridge-type roller system with four interchangeable cartridges supplied to cope with various products, with a fifth option for greening crops or other products. Metering access is also much improved, which now resides to one side of the hopper. This especially helps when calibrating the machine. Once a seed rate has been inputted into the drill’s controller, pretty much all calibration can be done externally. The metering unit can be isolated from the tank via a sliding shutter, which is good if you need to change cartridges. 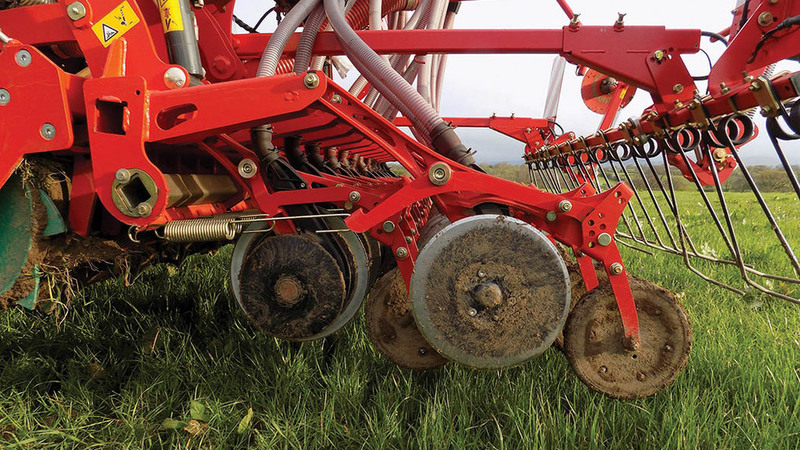 With its clever distribution head, tramline settings and adjustment are extensive on the e-drill and include the ability to alter tramline spacing, track width of tramlines and width of each tramline, which corresponds to tyre width. A useful feature when approaching an obstacle in the field is the ability to lift a marker but not trigger the tramlining kit. You can also preselect left or right markers, if working out of sequence. At the rear, tramline marker discs offer a visual indication a tramline has been made. Width of this is also adjustable. A manual half-width shut-off blanking plate can also be put into place in the head, allowing various tramline widths to be accommodated for when starting up against a field edge. Coulters are technically single disc type CX-II, but feature a plastic ‘scraper’ disc to keep the main disc clean, helping its performance. Considering our sticky and wet conditions, the drill coped well, with very respectable seed placement. Via a pair of rams featuring shim adjustment for depth control, coulter depth adjustment is now much easier and does not require each individual coulter adjusting. Individual adjustment can still be made via pins, but with fewer hole options on the press wheel arms than previous. Coulter depth is relative to packer roller position, which move together to follow contours via a parallelogram linkage. For additional ground clearance when lifting at headlands, the depth adjustment rams can be used to give extra lift to the seeding unit. This is really handy when finishing off headlands, especially in corners. Coulter pressure can be adjusted via a single screw (hydraulic adjustment is an option) and coulter press wheels can be set to rigid or flexible mode. The latter allows better ground following in stony conditions, for example. You can also take the press wheel right out, perhaps towards the end of the year in wetter conditions. Taking care of cultivation duties is the new H-Series power harrow rated to 180hp. As well as a new trough design, it also gets a revised packer roller. The latter sees the previous aggressive shark fin design, which had a tendency to flick clods up, altered to a more rounded profile designed to leave a better finish. And it does too as found in our challenging conditions. As mentioned, the packer roller is attached to the power harrow via a parallelogram linkage, which can have its range of travel adjusted via two sets of pins; an upper limit and lower limit. Depending on where the lowest depth stop is, you may also need to adjust the metering activation switch. Packer roller scrapers can be adjusted individually or all at once. A parallel linkage on each of the power harrow’s sideboards offers vertical movement without losing any soil, which can happen with swinging sideboards. They also fold underneath the power harrow, reducing transport width. Following harrow pressure can also be screw adjusted, with the harrow’s pitch altered via bolts. For maintenance, all main pivot points can be conveniently greased from the pin ends. Key to making the most of this drill is getting your head around the Tellus Go terminal. Once you have its controls sussed, the actual physical mechanics of the drill are very easy to understand. It is well laid out with good central adjustment of most elements, which makes setup quick and easy. Easier setup also means you are more inclined to get the most out of the drill. Considering our challenging conditions, it coped well throughout the test. As for longevity and reliability, only time will tell.